Compared to much of Europe, the city of Berlin is not that old. Apparently, in an effort to conjure up more gravitas, they became expert at erecting buildings that quickly aged, giving the city a more solid and enduring air. This even has a name, historicism. Now, the city specialises in a style of architecture that is determinedly modern, all glass and steel, which sits oddly alongside the old stone buildings and geometrically perfect platzes that still exist. 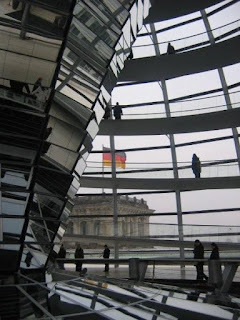 The new Norman Foster-designed dome over the historicist Reichstag is one example. The dome is fantastic when seen in isolation, but I'm not sure how well it sits within the traditional stone facade. 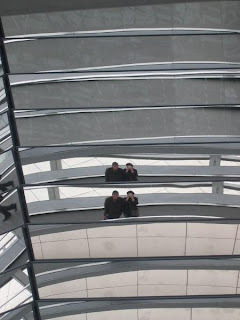 The Reichstag's new glass and mirrored dome. The glass represents democratic transparency (not sure what the mirrors are for, unless it's to make the point that MPs are really us!!). You can even peer down the centre of the dome and see parliament at work. 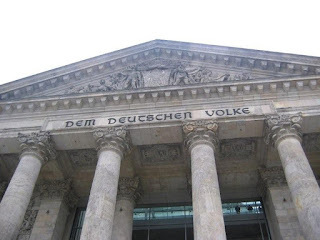 And here's a bit of trivia for you - the words on the front of the Reichstag, Dem Deutschen Volke (the German people), were made from melted down cannons captured from the French in the Franco-Prussian war. 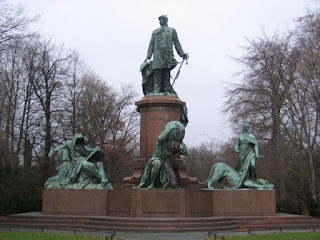 This victory marked the start of the modern German state, and Bismarck, who is immortalised in the Tiergarten, was its mastermind. 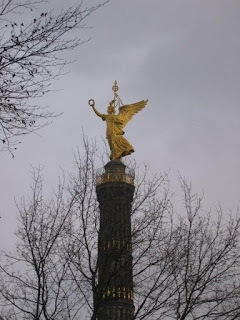 In honour of this victory, and those over the Danes and Austrians, the wonderful Victory monument was erected in the Tiergarten. It was one of our favourite monuments, in a city that specialises in them. The classic, Grecian-inspired frontage of the Reichstag. Bismarck surveying all from his spot in the lovely Tiergarten. 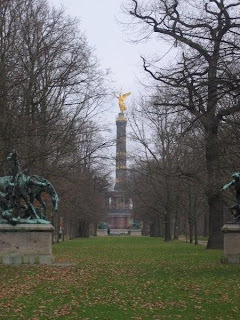 The beautiful Victory Monument has pride of place in the Tiergarten. 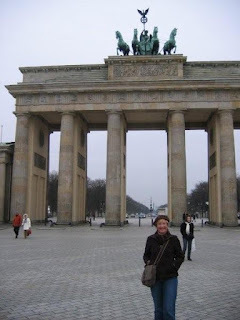 The famous Brandenberg Gate, from Pariser Platz, home to embassies, including one being built for the US. There is some discussion as to whether pedestrians will be allowed to roam the platz, once it is up and running. Underpinning the theme of historicism, Berlin has some of the world's greatest antiquities in its museums. We had occasionally come across mention of various Berlin museums in north Africa, as currently (though temporarily!) housing Egyptian and Nubian treasures, taken during the great discovery period of the late 18th and early 19th centuries. The Egyptian culture minister was especially colourful and vocal in his desire to get Nefertiti, a beautiful bust of the famous Egyptian beauty, back to Cairo. Doesn't sound like it's going to happen though. The Altes Museum director was quoted in Air Berlin's magazine, saying, "it would be irresponsible to expose Nefertiti to risks...". Along the River Speer is Museuminsel, Museum Island, the site of a number of Berlin's top museums. We chose to visit the Pergamon Museum, named after the Pergamon Altar (below) which was removed from its original site in Turkey and has been reconstructed inside the museum. Measures were taken during WWII to protect these treasures, and they are now displayed in all their glory. The altar is surrounded by a frieze of over 100m, which, while much of it is missing, is still quite awe inspiring, specially when viewed from the altar steps, while fiddling about with one's audio guide! You can get a sense of the scale of the Altar from this photo (thanks Wikipedia). 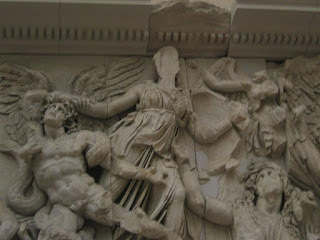 This section of the frieze above shows Athena doing her bit to win the war against the terrestrial giants. The Istar Gate from Babylonia is also completely restored and reconstructed inside Berlin's Pergamon museum. 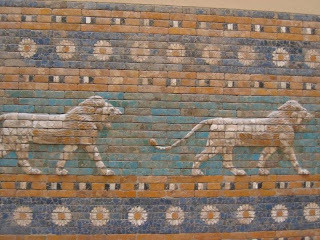 These lions are in relief, standing out from the surrounding tiles; the craftsmanship is superb, and about 2500 years old. Another particularly Berlin word we learned was ostalgia - nostalgia for the days of East Germany. After the euphoria of the Wall coming down, the reality for Germans of both east and west Berlin was higher costs, higher unemployment, higher taxes...so in some quarters rose-coloured spectacles have been directed to the more simple days when Berliners on the east didn't have to make decisions and were assured of work and financial support for their whole lives. 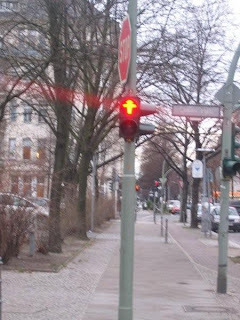 The cutest has to be the image on the street lights, the Ampelmann, who is now spreading into the old western district. This guy is so cute, he wears a little hat and is unequivocal in his urgings to walk or wait. I think he should be exported to the whole world, to replace our unappealing androgynous figures. Ostalgia shows in the revival of the now-hip Trabant. 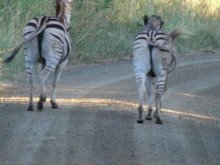 There's a company in Berlin called Trabi Safaris. 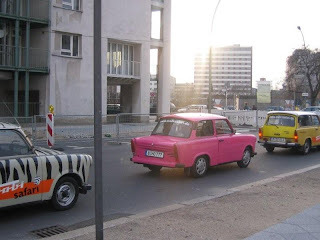 We did a walking tour, but you can also take a Trabi tour round the city's hot spots. 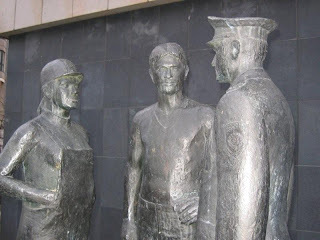 This statue is outside the Stasi Museum, where you can see what now seem rather quaint spying mechanisms including hidden cameras and tape recorders. 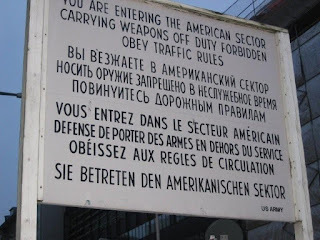 This famous sign is immortalised at Checkpoint Charlie on the old border of east and west. The nearby museum is an eclectic and slightly random collection of escape stories and artefacts. On a (recommended) walking tour of the city, we learned that the name Berlin comes from a Slavic word "birl", meaning swamp! This explains the city's dampness, flatness and naturally enough the large number of bicycles, not to mention fast marathon times. 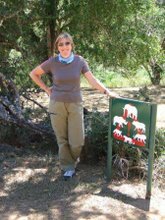 While we were there in mid-winter, the days were fine enough, though brisk for us compared to mild Andalucian temperatures, but I noticed that my photos all seem to have a sort of gray haze across them. 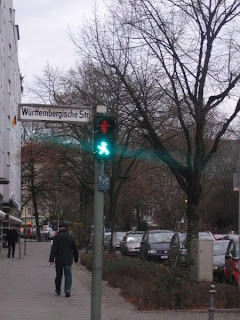 It's more a lack of brightness than a dullness, but it's a useful metaphor to describe the nature of Berlin - the last century and a bit has been a rocky road for this city, and its citizens appear to carry the weight of the world on their shoulders. They too come across as a little faded and distant. Germans obediently leave their bicycles on these thoughtfully provided racks. As in Amsterdam, German women have mastered the art of cycling while looking elegant and poised. Berlin is the city where Germany washes its dirty linen in public. 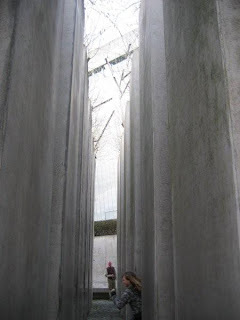 There are memorials to the Holocaust - currently just the one for the Jewish community is completed, but those for other persecuted groups are in the planning. 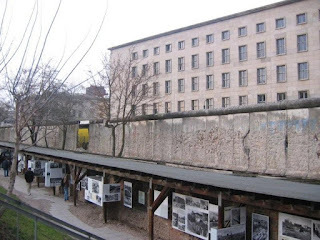 There is an outdoor exhibition called the Topography of Terror - a series of photoboards showing executions, forced marches, prison and concentration camp scenes that stretches for at least half a kilometre. There is more information of a similar nature where the Gestapo interrogation cells were uncovered, after having been buried during a bombing raid. Checkpoint Charlie is the site of more outdoor information boards with the history of the Cold War told in statistics and photos. The war memorial is blessedly simple, but tellingly contains soil from concentration camps, together with bones of unknown victims, as well as the more usual unknown soldier. 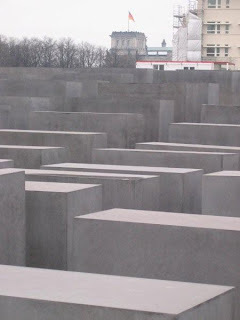 Berlin's new, and naturally enough controversial, Holocaust Memorial. There are 2700 stelae, all different sizes but placed pleasingly and within sight of the Reichstag. 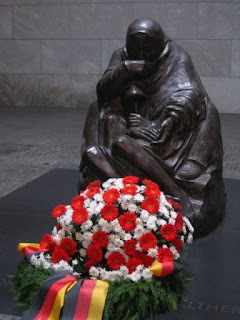 Kathe Kollwitz sculpted Berlin's moving war memorial in memory of her son killed in WWI. It sits in yet another Grecian-inspired edifice, beneath a hole in the roof which lights the interior and means the sculpture is exposed to the elements. 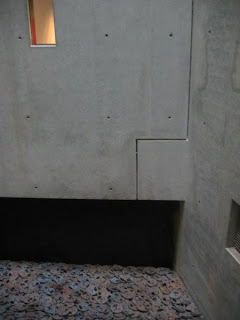 The museum building is designed around a series of voids, in reference to the gap left in German life by the Holocaust. The garden is integral to the design, and consists of a series of tall concrete columns, placed on an uneven surface, with willows planted on the top, visible from slits in the museum walls. The museum though is a fabulous place, a stunning piece of architecture containing the full story of Jewish culture and history in Europe. We spent over three hours there, only stopping for a brief Kosher coffee break! The garden was full of raucous German schoolchildren racing about, which was a relief after the often harrowing displays inside, and the disconcerting 'voids', this one containing metal discs of faces, all identical. 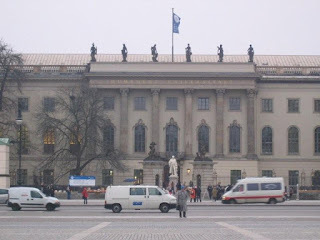 Humboldt University, alma mater to nine Nobel prize winners, but infamously also the source of the bookburners of 1933. A plaque across the road remembers the event. It's not just WWII that has left its mark in Berlin though. The Cold War immediately afterwards is still very visible, though not as much as it was. 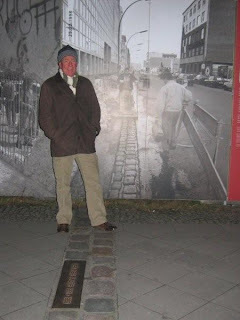 I went to Berlin for the first anniversary of the Wall coming down, in November 1990. Then it was everywhere, now it's almost nowhere. In fact, special bits of it are protected by, well, a wall! And its trace through and around the city is marked by a bricked line. Most of the Wall is now a faded memory, preserved by a line of bricks snaking through the city and a series of photoboards. A small stretch of the old 100 mile+ Wall has been preserved for posterity. Behind is Goebbels' Air Ministry building, now used by the tax department. Berlin wasn't all museums, memorials and gloomy history though. We enjoyed the food, specially the local wurst and of course the beer. 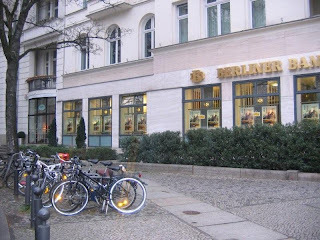 The shops on the Kurfürstendamm were great for window shopping, but we indulged a little at the more down-to-earth department stores. And we did a pub crawl, mostly through the Mitte area, the centre of old east Berlin, and now the heart of rejuvenated urban living. 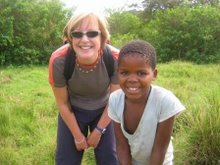 (Hi to Chris and Helen, if you're reading this!). It was great fun, I think! 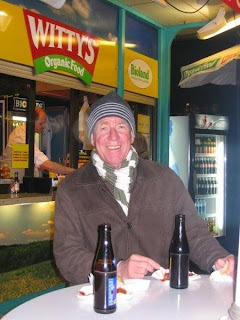 You can't beat an organic sausage teamed with an organic ale, eaten outdoors on a brisk Berlin evening. I think I will leave the last word to the guy who is so famous in Spain that he graces our one Euro coin. We rather surprisingly came across this in a suburban street, not far from the Jewish Museum. 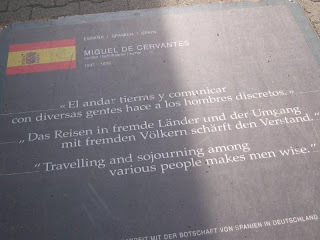 Cervantes was obviously well-travelled and certainly wise, or discreto, at least.